Chapter One. Diversity of Entomopathogenic Fungi: Which Groups Conquered the Insect Body? 4. What Constitutes a Virulence Factor? 4. Natural Occurrence of Beauveria and Metarhizium in Ants: Opportunistic Parasites? 2. What Is Behavioral Manipulation? 6. Can Behavioral Manipulation be Evolved In Silico? 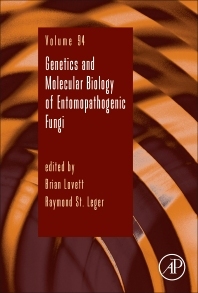 This thematic volume focuses on the advances and the future potential of the rapidly growing field of entomopathogenic fungi. With a focus on the genetics and molecular biology behind the progress, techniques developed to study all aspects of these fungi will be highlighted, and topics will span from systematics of fungi to how a fungus infects an insect and how that insect responds. "The book is organized with a logical flow and begins with an overview of the different phylo-genetic groups where insect pathogens evolved, providing ample context for the subsequent chapters exploring more detailed and nuanced subjects. It s an excellent and very complete and updated book on the subject. Dr. Lovett works at the Entomology Department at the University of Maryland. Dr. St. Leger works at the Entomology Department at the University of Maryland.